DataPipe is here, and has many new time-saving features to help you work smarter. DataPipe rescues you from having to fix up database fields by writing horrendous SQL queries or extracting the data, fixing it and re-importing. Sophisticated search and replaces can be performed with ease. 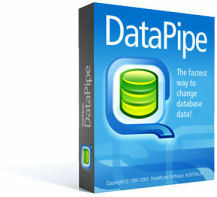 Since DataPipe uses TextPipe Pro, you may also wish to see what's new in TextPipe Pro. Affiliates - sell TextPipe from your website! DataPipe has all the new features you need to be more productive. Try DataPipe today, you'll love how efficient you can be! You'll love what you can do with DataPipe! Try it today. Total rewrite for x64 - new internal controls. Faster. Upgraded included TextPipe to v9.5. confused about how many filters it showed in this history list. Now includes TextPipe Pro as part of the install. New Syntax parser for SQL. Support for the latest TextPipe, and /UNINSTALL parameter. New release for new release of TextPipe Pro. Now checks the TextPipe version number and gives a warning if it is too low. Syntax highlighting editor for SQL code. DataPipe can now be completely automated via the command line. form - ready to insert into a batch file. Language strings for combo boxes now loaded. Minor changes to handle TextPipe Pro 6.4.1. Row height now automatically adjusts to font size. Added control over the cursor type, cursor location and lock type. available from the data provider. Now traps errors like the record being deleted. If errors are detected, the error label can be clicked to show the log file. Tip of the Day now defaults to On. Added logging to generate a detailed audit trail. A default query is now inserted when the query string is blank. clipboard, which can then be easily used to test the TextPipe filter. when sample data is available. Status window now stays on top. Improved handling of Asian languages. Now beeps on job completion. prompted to save changes twice. the sample results grid. This value is also saved with the settings file. Requires TextPipe Pro 6.2.8 or later for better integration. New menu item and toolbar button for 'New' settings. Transform Grid now resizes the filter name columns to its maximum. prior to opening a new file or the settings being cleared. The history of previous filter names now drops down 10 rows. TextPipe - to see if they exist before a preview or main run is initiated. This makes errors quicker to identify and handle. New demo database and sample modifications are included in the installation. Grids now show update messages when preview data can't be displayed. Go button now updates immediately when it is pressed to give visual feedback. New status messages to indicate what is being processed. 'Save' and 'Save As' now add the filename to the recent files list. of the last loaded file. The preview grid now copies its column widths from the sample data grid. Far better handling of error conditions when filters cannot be accessed. Added 'Reconnect to TextPipe' menu item in case of RPC server errors. Fixed display bug with preview grid. Pro as the text value ''. depending on which tab sheet is currently displayed. Much faster - now uses early binding interface.